Simpl (it's a working title) is a Chrome extension to save web images directly to a Google Photos / Google+ / Picasa photo album. I created this because I use the Hangouts extension a lot and sending images from the web through it is a pain. Sure, you can just copy the image's link into the conversation, but embedding is much more fun, especially with gifs. 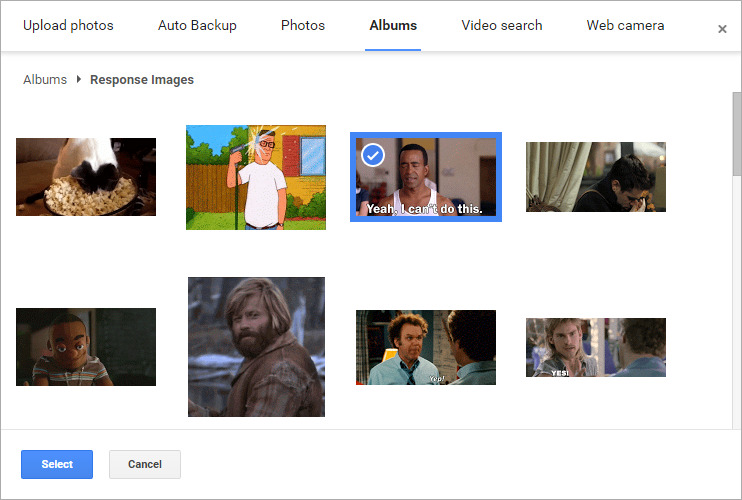 As far as I've discovered, you can only embed images in a conversation if you upload the photo from your computer or if the photo is in a Google Photos album. This means if you find an image on the internet that you want to embed in a Hangouts conversation, you currently have to save the file to your computer, then upload it via the Hangouts extension. This takes 4+ clicks and leaves your Downloads folder full of random images. Going this route is even more impractical if you're just wanting to save the image for later, which happens a lot if you happen to use reaction gifs. Once setup, Simpl allows you to save images on the web to a designated Google Photos album that you can then later use to embed in Hangouts conversations (or use however you want). Another use for this might be to save images from design sites for inspiration later. Simpl is basically an alpha product. I developed it one Saturday when I was frustrated with Hangouts, so it's not actually publicly available on the Chrome Web Store yet, but it is available on GitHub if you want to play around with it. I haven't done any additional development on it basically since it's initial development as it works well enough for me now, but I'm not sure that anyone else would actually want to use it.